of many departments working together to bring a complicated set to life. 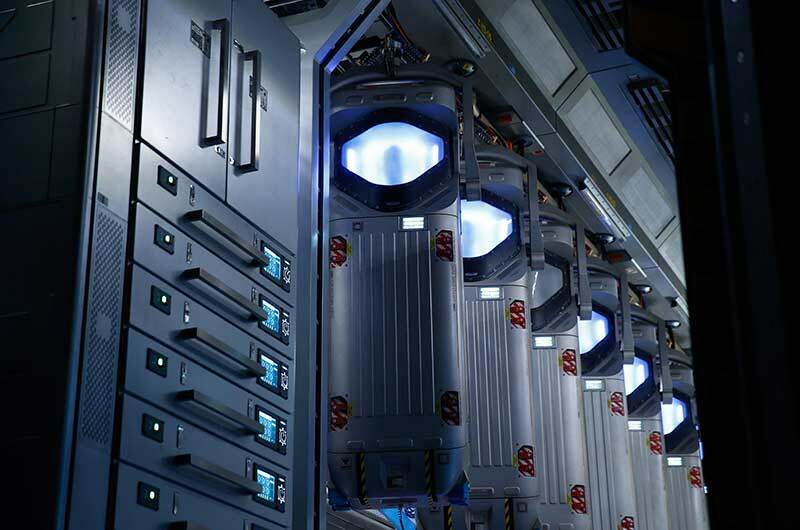 Life-pods of some of the 2000 space colonists deep in hyper-sleep. Did we mention, something wrong? The spaces are so dark and eerie...you’ll just have to see the film! 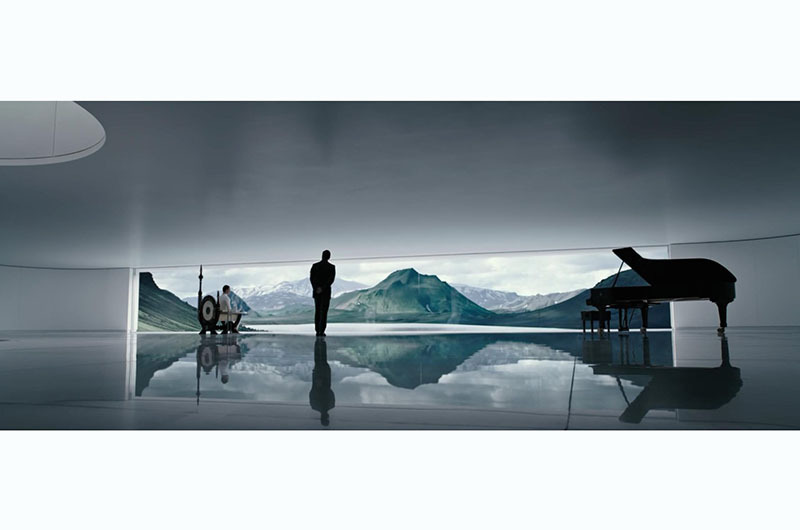 “The corridors are featured prominently in the film.Each section/area had different set dressing and graphics applications. The pieces all fit together in multiple configurations. 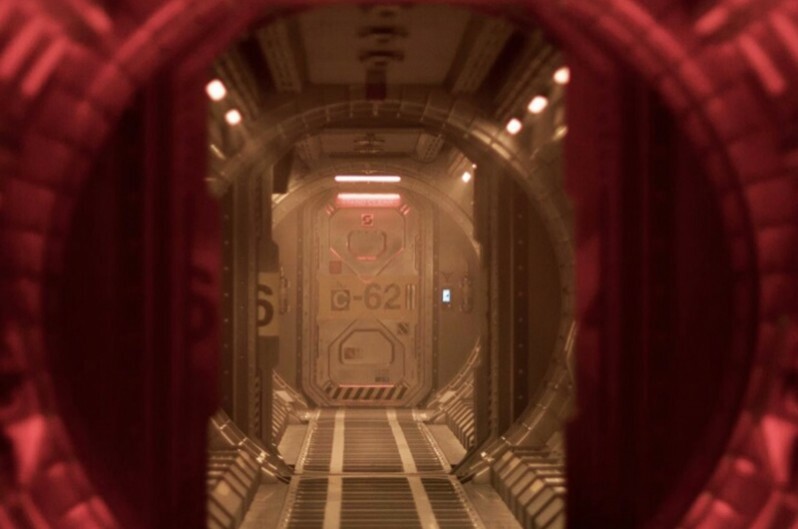 The corridor figures prominently in this scene, but we can’t tell you about it! Set Dec department and our amazing vendors. 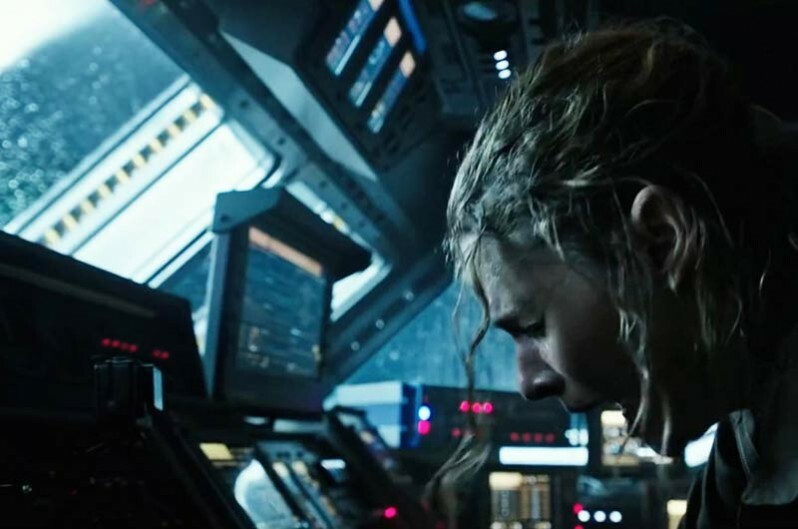 After nearly four decades, those words remain synonymous with the sheer, relentless intensity of Ridley Scott’s masterpiece of futuristic horror, ALIEN. 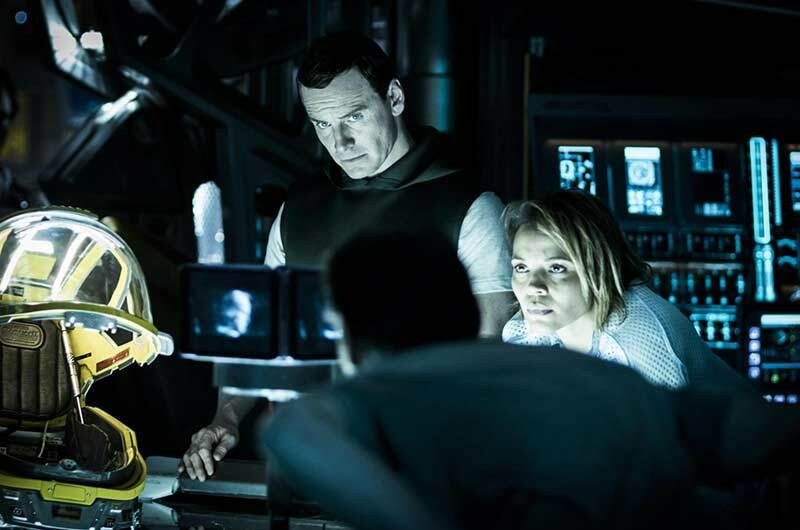 Now, the father of the iconic franchise returns once more to the world he created to explore its darkest corners with ALIEN: COVENANT, a pulse-pounding new adventure that pushes the boundaries of R-rated terror. All is quiet aboard the spaceship Covenant. 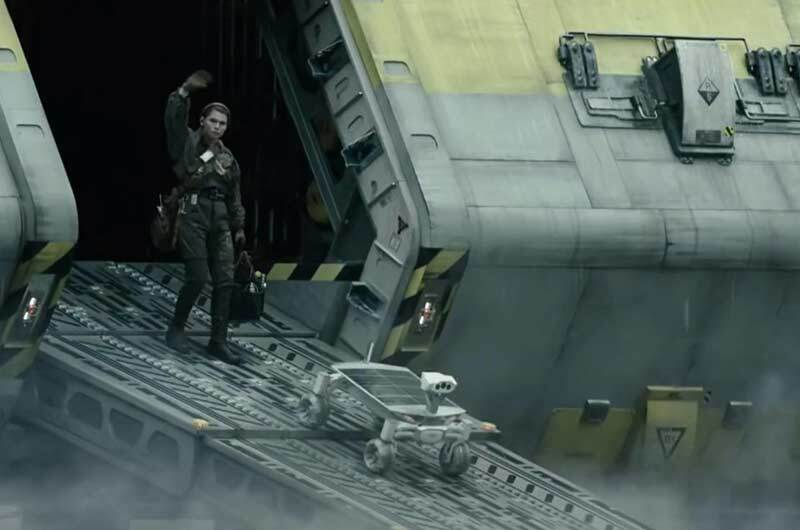 The crew and the rest of the 2,000 souls aboard the pioneering vessel are deep in hyper-sleep, leaving the synthetic Walter to walk the corridors alone. The ship is en route to the remote planet Origae-6 on the far side of the galaxy, where the settlers hope to establish a new outpost for humanity. The tranquility is shattered when a nearby stellar ignition shreds Covenant’s energy-collection sails, resulting in dozens of casualties and throwing the mission off course. 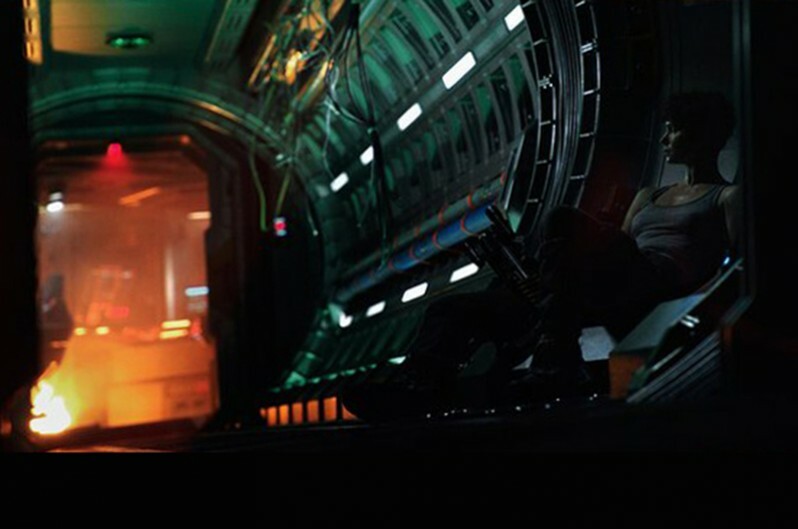 Set ten years after the events depicted in PROMETHEUS, ALIEN: COVENANT returns to the roots of the director’s groundbreaking saga with a uniquely terrifying tale filled with white-knuckle adventure and monstrous new creatures. 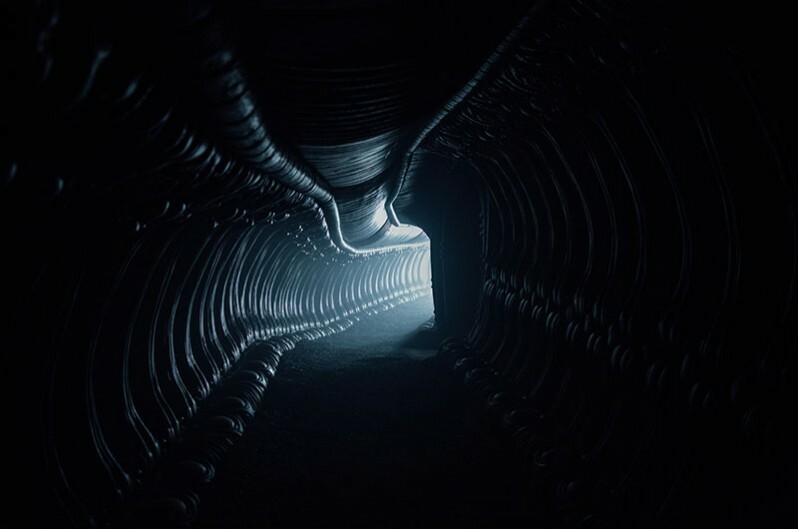 With this, the sixth installment in the blockbuster series, the visionary director edges ever closer toward revealing the mysterious origins of the mother of all aliens, the lethal Xenomorph from the original film. 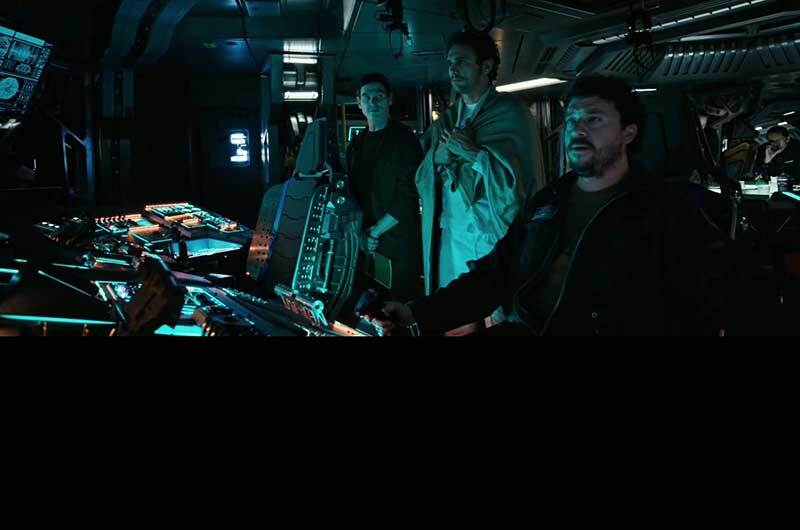 To do so, Scott brought in frequent collaborator Dariusz Wolski as Director of Photography, Chris Seagers and Victor J. Zolfo SDSA as Production Designer and Set Decorator, Charley Henley as Visual Effects Supervisor and, as always, Janty Yates to handle costumes. This dynamic team brought to eerie life the darkly beautiful, ominous world of Scott’s vision. 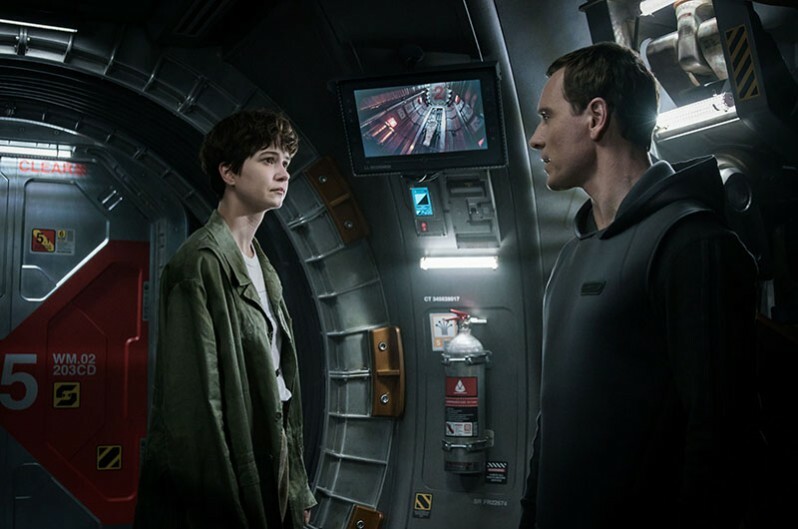 To amplify the claustrophobic feel of the interior, the team kept the vessel’s ceilings low, cloaked its corridors in darkness and added functional details to every surface, imbuing the set with an atmospheric reality. I remember going to see ALIEN for my 16th birthday in 1979. 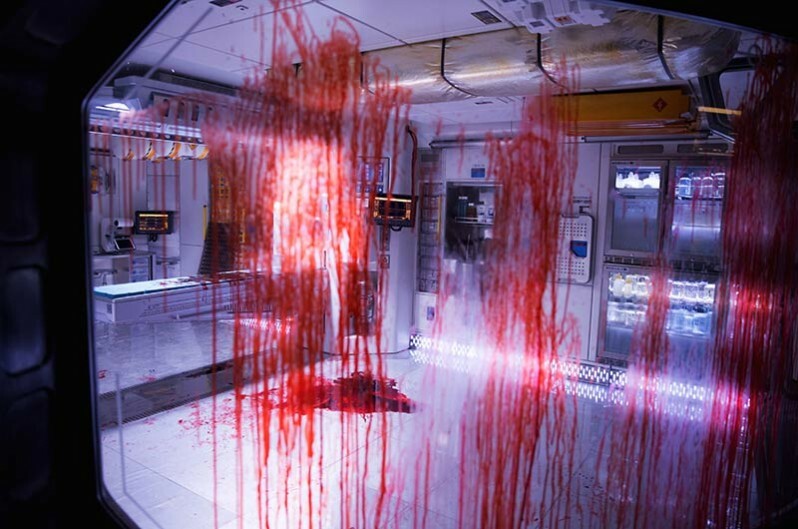 I had never experienced anything like it – a horror movie in space! The iconic imagery burned into my mind. 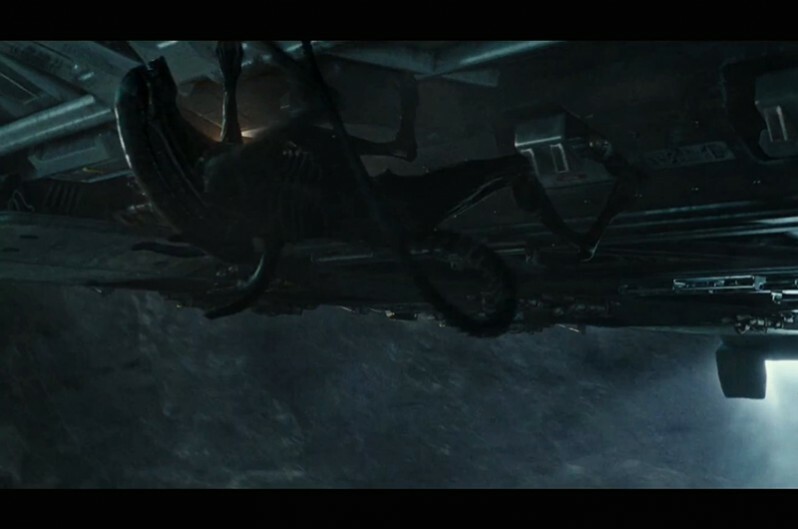 The look of the film in particular fascinated me, from Production Designer Michael Seymour’s grungy utilitarian ship the Nostromo to the creepily beautiful Giger alien ship, all guided by the masterful hand and imagination of Ridley Scott. It was a groundbreaking motion picture on so many levels, often imitated, studied and celebrated. 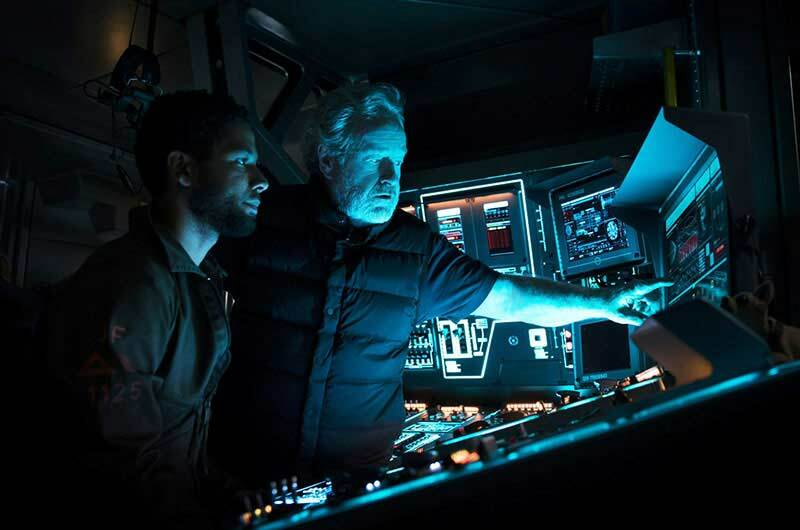 To be a part of Sir Ridley Scott’s return to the roots of the series was one of those opportunities rarely afforded, and I was extremely grateful and excited to be working with Chris Seagers for the third time. We traveled to Sydney where we took over Fox Studios Australia. 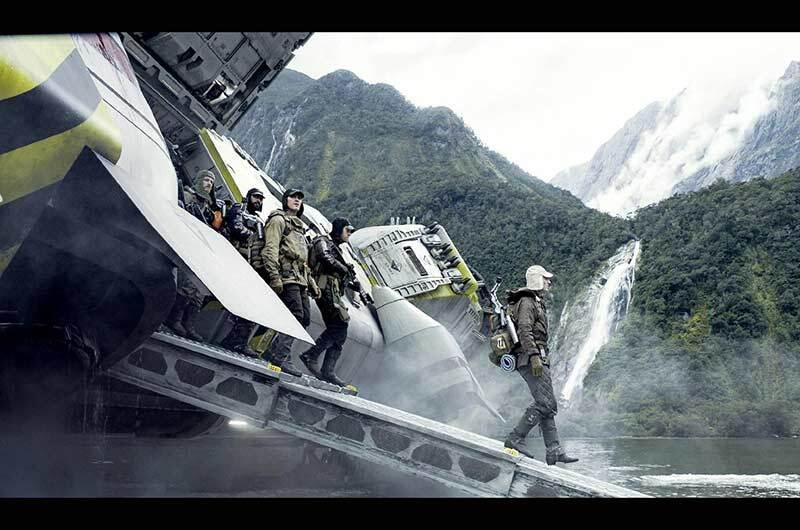 Sets were built on massive stages there, as well as at a nearby exterior location. Several exterior scenes were also shot in New Zealand. 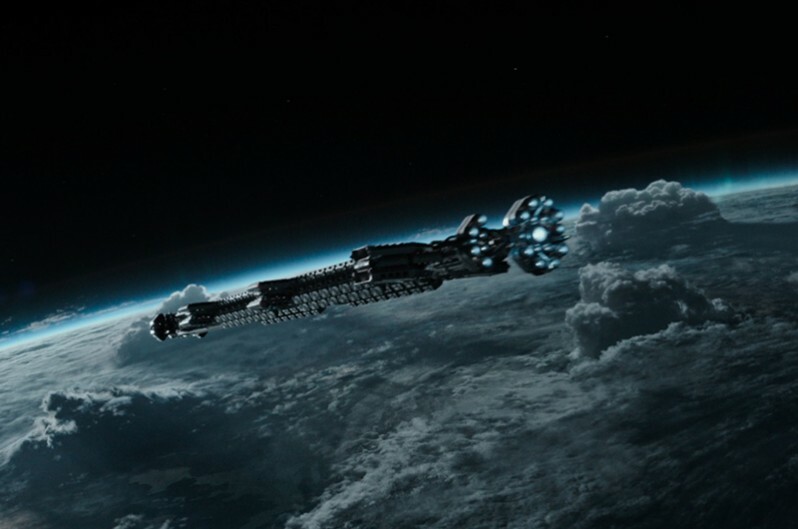 The idea behind the Covenant is that she’s a purpose-built ship meant solely for planetary colonization...and this is a one-way trip. Everything aboard has a very specific reason for being there. She’s a new ship, so there is not much wear as this is her maiden voyage. 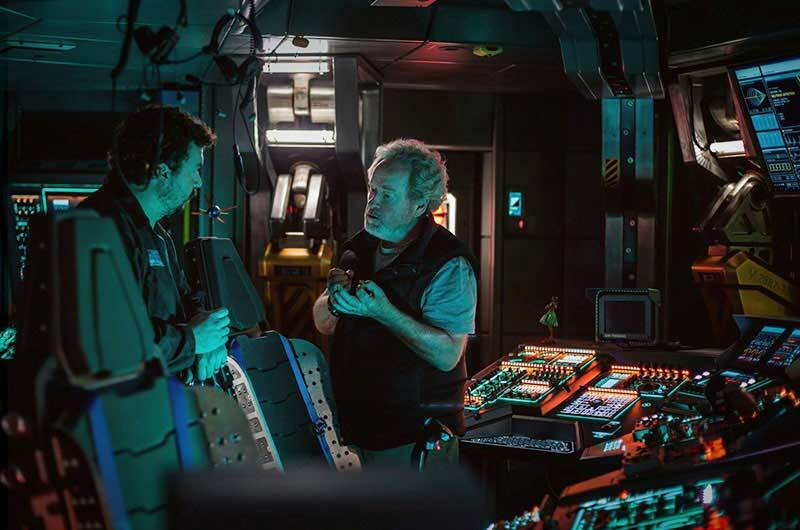 We were tasked in the set décor design process to make the ship a very tactile, interactive environment. 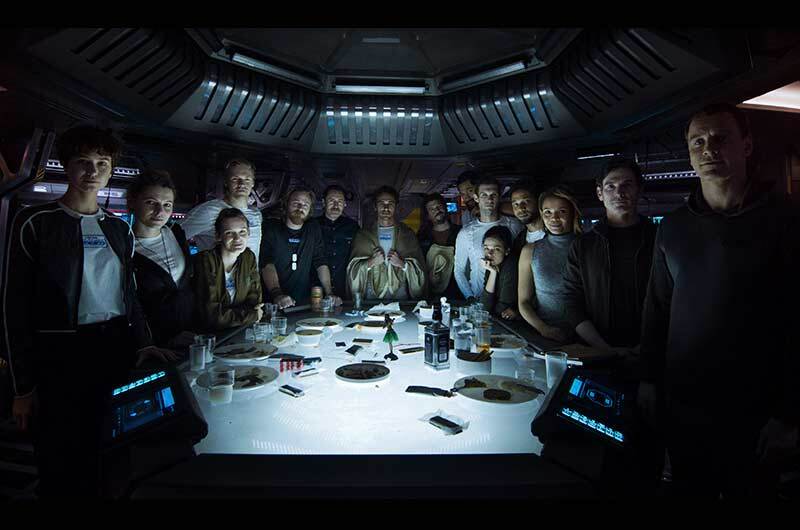 RS wanted many opportunities for the actors to feel like they were on a real, functioning spaceship. Every door or panel opened, every hatch was filled, every appliance could be turned on and off—RS wanted total authenticity. Assistant Set Decorator Katie Sharrock was often deeply immersed in the world of the cockpits and the huge amount of detail they entailed. 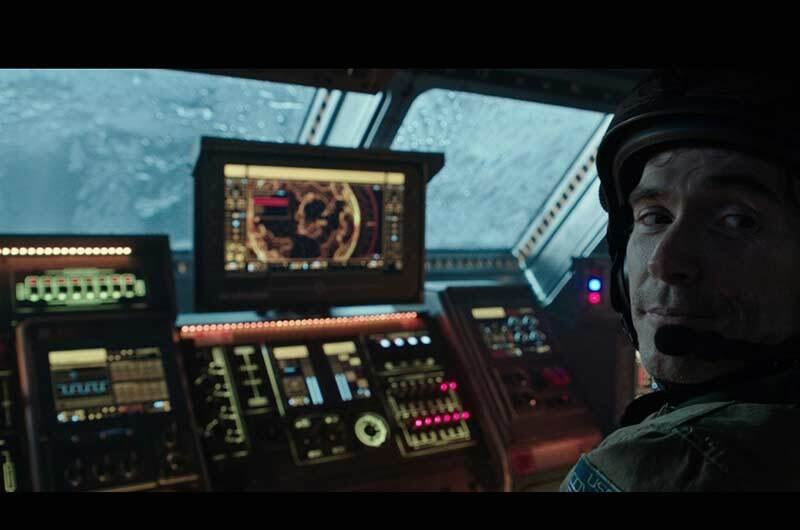 We shopped all of the details on the consoles—the intent was to keep the ship in general more analogue, more tangible, so that in many ways it is reminiscent of the Nostromo, which will appear 18 years later in the timeline. 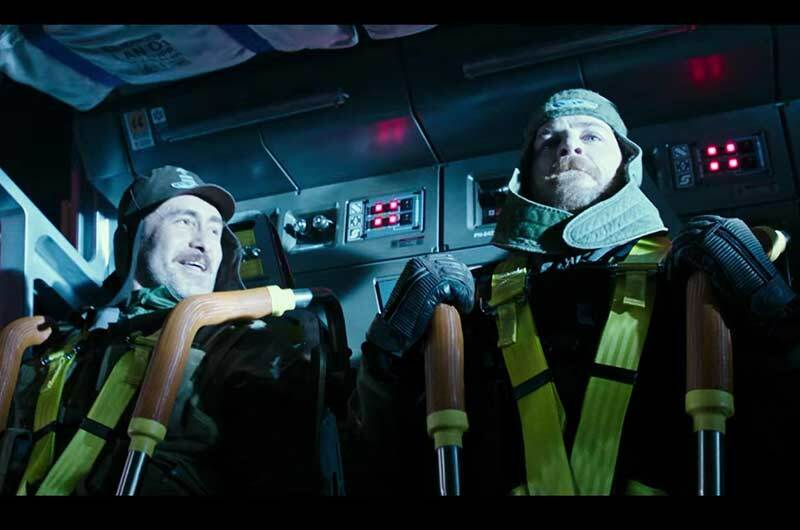 We had reason to stay grounded to thrusters and joysticks and operational knobs, toggles and switches. To add yet another layer of realism for the cast and camera, the Covenant, Lander and Lifter sets were built on sophisticated motion gimbals. These jolted and shook the set violently, so everything had to be securely locked down. With so much heavy set dressing, from the furniture, pipes and cables to the practical light fixtures, it became a challenge to fabricate the most lightweight, manageable elements that we could, for the sake of safety. There were many tests run shaking the sets once they were dressed to make sure everything was locked tight and that no lone screws or pieces of wire remained. Large scale sets with moving parts meant extra safety precautions. In Set Dec, we were constantly searching for interesting looking shapes and pieces that we could obtain in multiples for detailing out the walls, floors and ceilings of the Covenant—there is a tremendous amount of detail to all four surfaces. Again, because of the weight factor, we often used plastics and molded elements to create our language of ship technology, and kept that theme throughout the décor of the interior sets. It was no easy feat to obtain the repetition we required with the limitations of the Australia market, and we’d literally buy out the entire stock of items we required for dressing. 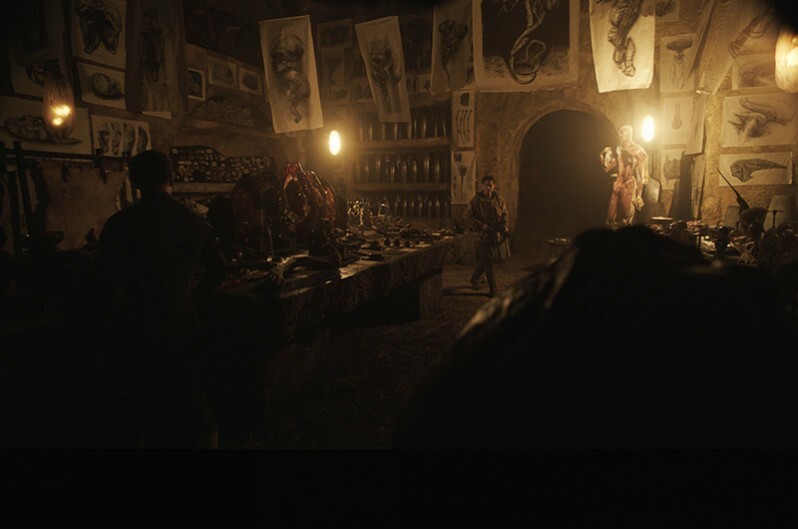 For example, there was a terrific relationship between the set decoration department and Conor O’Sullivan’s creature shop. 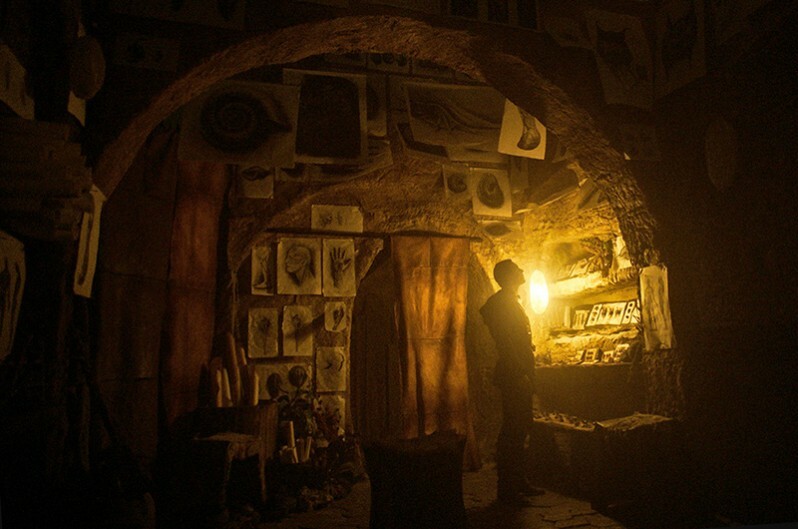 We worked together to create all the macabre displays in David’s Chamber. RS wanted this room to be the stuff of nightmares, so we reached for the rafters. In Set Dec, we created grisly experiments to fill the chamber and support and compliment the ‘hero’ alien experiments on display. It was great fun...and a little bit disturbing. How would David have catalogued and presented all of these horrors – each one personal to him - in his disturbing yet strangely beautiful aesthetic? We really had fun with it. Another huge undertaking was to create the hundreds of drawings done by David. I was able to hire two artists in Sydney, Dane Hallet and Matt Hatton. These two powerhouse illustrators were able to create and work in a “shared hand” so that all of David’s works look like they were done by the same individual. Then they literally spent months producing hundreds of Victorian-style plates of flora and fauna of our mysterious planet, as though David was a renaissance man of sorts and cataloging all the wonders through a naturalist’s eye. The artwork tells a story in and of itself. David’s calligraphy style, by turns naive and sinister, was chosen by RS and imitated to perfection on hundreds of pieces of vellum by master Calligrapher Heather Courtis. 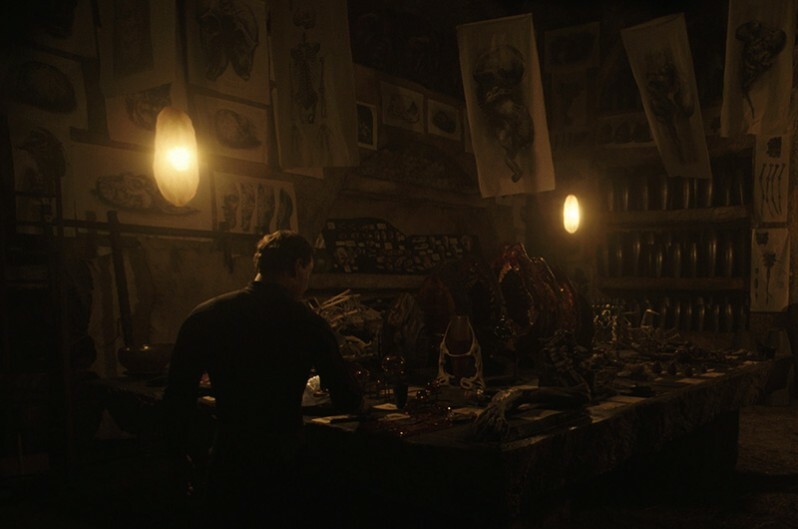 Led by Leadman Christopher Bruce, the Set Dressing crew was equally at home dressing the mechanical world of the Covenant as well as the organic, grotesquely beautiful world of David’s environment, which included an immense exterior ancient plaza and stairs covered in fallen “bodies”. Ridley likes it to be real whenever possible, so we worked with the creature department every night of that sequence to dress over 100 “dead Engineer bodies" in a path across the plaza and up the giant stairs, which the visual effects team then extended. There were sculptural and foreground elements as well. 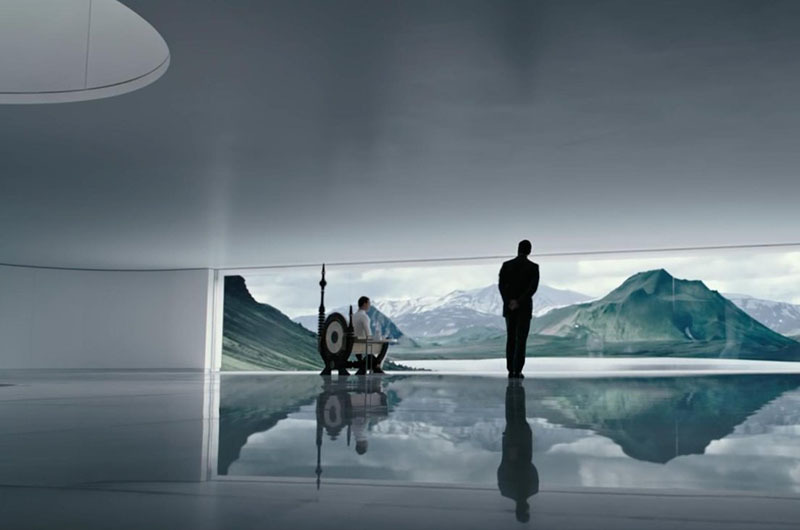 Rarely did we see just a bare green screen—there is always practical scenery and set dressing. The textiles for the Engineer world had a language all their own. 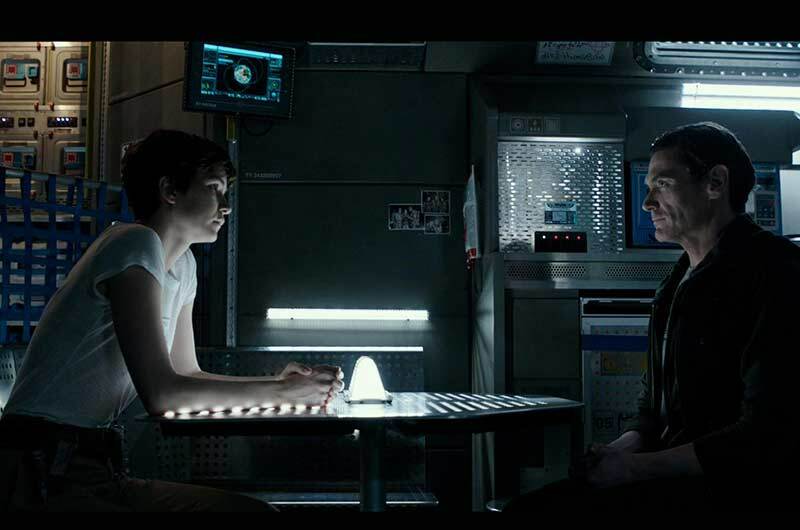 RS was already very happy with the fabrics established for the Engineers in PROMETHEUS by Costume Designer Janty Yates. Naturally, I was asked to keep all the set dressing textiles in the same vernacular. Inside the enormous Hall of Heads, our decorating design called for hundreds of meters of raw linen, a material very similar to what Janty was using on the Engineer’s costumes. The original sample came from Italy, but when I needed over two thousand meters in a short turnaround time, we reached out to India and had it loomed—a bit of a harrowing waiting process, but it was delivered as promised and we were able to dye, manufacture and install the panels on schedule. We could not have managed the massive amount of fabrication and the sheer volume of set dressing and props without the fantastic work of the Propmaking Shop headed by Peter Wyborn and Adam Grace. Leading a staff of dozens of artisans and craftspeople, they were able to both engineer and manufacture everything that was designed, and troubleshoot many complex projects. We often worked seven days a week in order to produce what was needed for the weeks ahead. 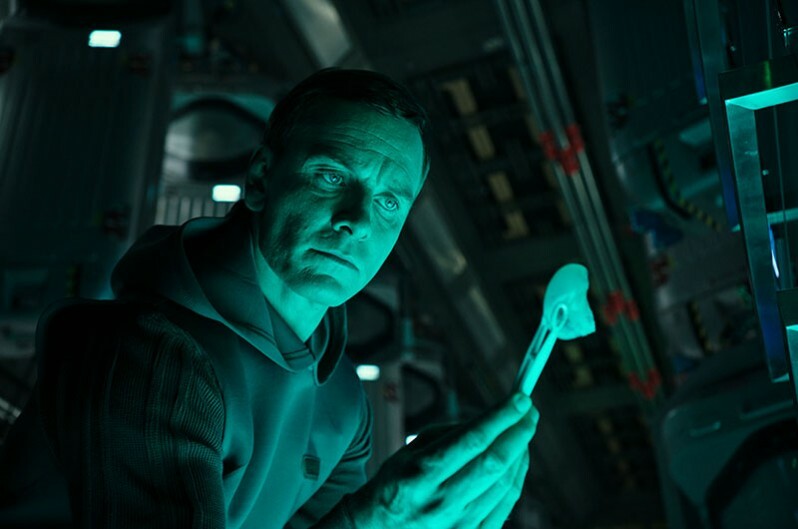 Be it scores of deadly pathogen urns (first seen in PROMETHEUS), dozens of fully functioning hyper-sleep pods or Engineer-scale handcrafted furniture, they were up to the constant challenges requested of them. For the White Room we had two replicas of a Carlo Bugatti “Throne Chair” manufactured in-house. I must say they looked like they came off the floor of a museum. Absolutely stunning. Again, this film was all about collaboration...generous, professional and dedicated people working together to bring about a film icon’s vision. It is a privilege to work with such a masterful director. He does all his own storyboards, can visualize everything and describe exactly what it is he wants. There are many meetings and presentations throughout the project, almost daily. Nothing is left to chance...there exists a story and a purpose for everything. It was a great challenge and a rare opportunity and I’m very grateful to have had it.